When was the last time you ate a kumquat? I’m not sure if they’re just rarely in my grocery store or if I always overlook them. Either way, I’ve always been interested in them but never really known what to do with them. I would typically bite in carefully, loving the taste of the peel and meat, but being too frustrated by the seeds to get much enjoyment out of them. Not anymore! Over the weekend I learned a new way of enjoying them, and now I’m pretty obsessed. It turns out that if you slice them really thinly, the seeds basically fall out (or can be removed easily). What’s left is the most delicious, mostly sweet, slightly sour fruit. It actually tastes quite a bit like candied orange peel without the added sugar or patience required when candying orange peel. 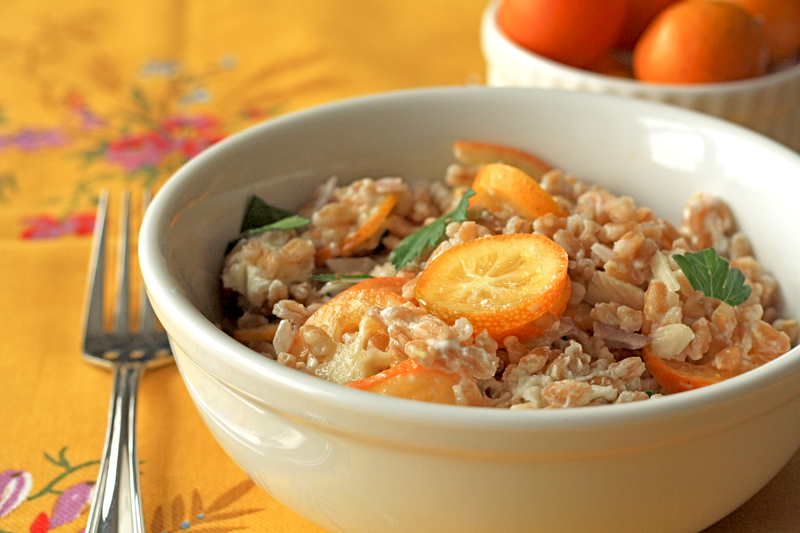 This recipe uses farro as a vehicle for showing off the kumquats. I love farro because it’s such a versatile grain that complements just about any ingredient in your fridge or cabinet (fruits, vegetables, cheeses, nuts, beans, etc). Try this recipe and let me know what you think! Cook the farro according to the package’s instructions. While it’s cooking, prep your other ingredients. Once the farro has cooked, drain and rinse it, then pour it into a serving bowl. Stir in 1 Tbl of olive oil, then mix in the red onion, kumquat slices, and parsley. Stir in the lemon juice, then the goat cheese. Taste and season with salt and pepper and additional lemon juice if necessary. Garnish, serve, and enjoy! This entry was posted in recipes and tagged cooking, easy lunch recipe, farro, goat cheese, grain recipe, kumquats, quick side dish, recipes. Bookmark the permalink. Hi 🙂 How lucky for me to find your post! I was as the grocery store yesterday looking at Kumquats and wondering what they tasted like and how to use them. I’ve never had them before … and now I have a recipe to try! Thanks so much for posting. Great photo!